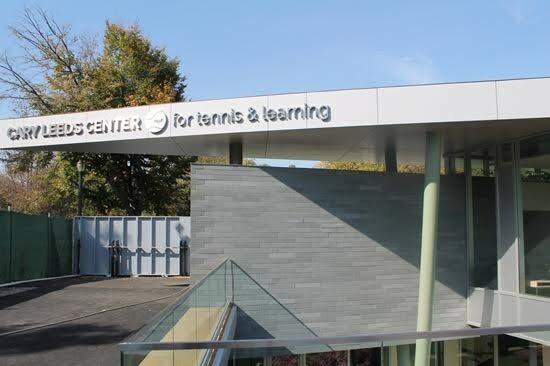 Cary Leeds Center for Tennis & Learning Crotona Park, the Bronx GLUCK+ Today’s Archtober Building of the Day tour of the Cary Leeds Center for Tennis & Learning in the Bronx offered a close-up view of GLUCK+’s construction process. The firm works in the architect-led design-build model, in which the architect also serves as the project’s general contractor. Our group of inquisitive participants asked GLUCK+ Principal Marc Gee about how this process works, from the company’s insurance requirements to day-to-day life in the office. According to Gee, the system works because “architects are able to think on their feet in terms of design, not just the project’s bottom line.” The bottom line, of course, is also very important. This project was a public-private partnership between New York Junior Tennis & Learning (NYJTL), an after-school and summer program that offers free tennis lessons, mentoring, and leadership workshops to local youth, and the NYC Department of Parks & Recreation. Because it was an open-book contract, GLUCK+ worked closely with the client to adjust the plan as the budget allowed, such as substituting bluestone for the less expensive brick that had originally been planned for the building’s core. In the end, the project came in $2,000 below the guaranteed maximum price. There were a few hiccups along the way. The design of a poured-concrete stairway was not completed until after the building’s windows had been put into place, and then there was only an inch-and-a-half of clearance to get it inside. Now that it has been installed, though, you’d never know what a headache the staircase caused. Brand-new colorful tennis balls fill in for plantings or a fountain that we might expect to see at the bottom of the stairs. For every GLUCK+ project, someone from the firm is on-site throughout the construction process, on hand to deal with any problems that might arise. After all, “there’s no one who can look at a set of drawings better than the person who drew them,” Gee said. Archtober-ites will head to the Lower East Side bright and early tomorrow to tour PBDW Architects’ renovation of the Educational Alliance by PBDW Architects. Julia Cohen is the Archtober Coordinator at the Center for Architecture. Whitney Museum of American Art 99 Gansevoort Street, Manhattan Renzo Piano Building Workshop in collaboration with Cooper Robertson When the Whitney Museum made the move from its iconic Breuer Building to a new location in Manhattan's Meatpacking District, the institution was “returning to our downtown roots,” Larissa Gentile, New Building Project Director for the Whitney, told today’s Archtober Building of the Day Tour attendees. The museum’s shiny new steel-clad, Renzo Piano–designed building, which opened in May, is situated between two linear parks running through Manhattan. Piano conceived of the building as a link between the High Line, just east of the museum, and Hudson River Park, just west. Visitors to the Whitney never feel far from either of these green spaces—on each of the eight floors of the museum, strategically located windows frame scenes of the Hudson River and out onto the city skyline. The interplay between interior and exterior is a defining element of the new Whitney. Gentile described the institution and the architect’s intentions for the building to engage in a dialogue with its urban context. The building has eastward-facing terraces on each level of the museum, connected by an outdoor staircase. 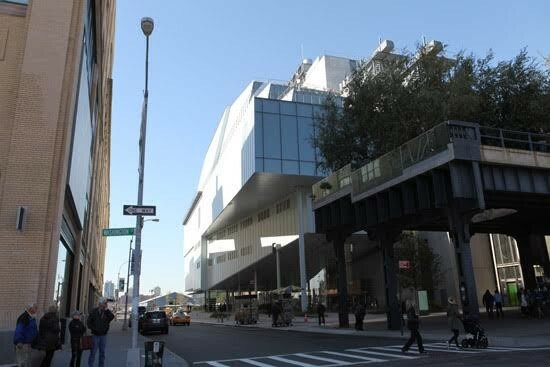 These “outdoor galleries” not only give museum-goers iconic views of stretching across Manhattan, but also allows those strolling down the High Line, or driving down the West Side Highway, an opportunity to see some of the museum’s impressive collection. The exterior staircase allows visitors to move between gallery floors outside, so as to alleviate some internal circulation issues that might arise given the museum’s record-breaking number of visitors. On the ground level, the museum lobby is a porous and open glass space, meant to feel like an extension of the pedestrian streetscape. Passersby glimpse what is going on in the museum—indeed, today, although the museum was closed to the public, people walking by were privy to the installation process of the new Frank Stella exhibition underway. “Exposing the machine of building, and revealing the institution as an entire organism, was an exciting opportunity for the museum,” Gentile told us. Throughout the building, staff offices, research spaces, conservation labs, and educational facilities, that, in the old building, were either non-existent or tucked away, are now revealed to museum-goers. The new Whitney has greatly increased gallery space. Each gallery was designed to be column-free and highly flexible, so as to allow curators and artists to reimagine the space with every show. The gallery size and ceiling height varies from floor to floor, giving the museum a distinctly different feel as you travel throughout it. The top floor gallery is bathed in natural light from a skylight above. Some galleries are much more intimate, displaying smaller paintings and works on paper, while more spacious areas of the museum house impressive sculptures and installations. In addition to adding more gallery space for the museum to display its 22,000-object permanent collection and creating new educational and conservation facilities, the new, soon-to-be certified LEED Gold museum building also houses a flexible theater space with multiple projection options, and retractable seating, allowing the museum to host lectures, performances, and installations. As Gentile told our tour, “No space here has one function.” The highly mutable building provides the opportunity for the institution and visitors alike to engage intimately with both the cultural and urban milieus this city has to offer. Alex Tell is the Committee's Coordinator for the AIANY | Center for Architecture. An assemblage of Archtoberites and Open House New Yorkers explored the General Society of Mechanics & Tradesman today with Victoria Dengel, executive director of the organization. 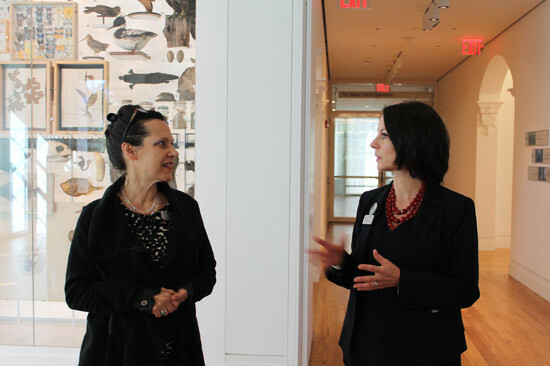 She was joined by two of her tenants, Lisa Easton, AIA, a partner at Easton Architects, and Seth Weine, a Fellow of the Institute of Classical Architecture & Art (ICAA). Theirs are among the many organizations and companies housed in the 1890 building, which began its life as the Berkeley School for Boys before being acquired by the General Society and expanded shortly thereafter. Founded by 22 artisans, including a cooper, a coach-maker, and a tallow chandler, the society celebrates its 230th anniversary this year. Its first president was the blacksmith Robert Boyd, a fitting choice because blacksmiths made the majority of other craftspeople’s tools. The society’s records date back to its founding, and include a logbook with the names and trades of its members. Andrew Carnegie identified himself by his original job as a cotton spinner rather than the leading industrialist and philanthropist he had already become. We started our journey in the library, which had once been the Berkeley School armory. Founded in 1820, before the society moved into the space, it was one of the first subscription libraries in the United States, with a collection of 4,000 volumes that has since grown to more than 100,000. Its mezzanine houses the John M. Mossman Lock Collection, which includes locks and keys dating from 4,000 BC to the twentieth century. Across the hall is a meeting room used for the General Society’s monthly meetings. It appears occasionally in ads and films, so keep an eye out for it this football season. Next, we climbed the stairs to the sixth floor, where Weine showed us a collection of plaster replicas and molds of some of the finest works of classical art. We also got to step out of Easton Architects’ office and onto the magnificent fire escape that extends down toward the library’s massive skylight, which was restored in 1999 after being blackened out since World War II. Easton was an expert guide – she wrote the building’s 700-page historic structure report a couple of years ago. After the tour, we wound our way back down to the library, stopping briefly in the sweet-smelling offices of the New York Botanical Garden. Although only a handful of today’s visitors had been to the building before, I’m certain that we will return to sample the General Society’s many programs, or simply to view the landmarked façade and building with a little more elbow room. Tomorrow, we’ll check out the CUNY Advanced Science Research Center and the City College Center for Discovery and Innovation. Christoph Bartmann, director of the Goethe-Institut New York, began today’s Archtober tour with a history of its time in the city. After many years on the Upper East Side, the organization had to relocate to a temporary space in Soho to comply with German fire safety regulations. 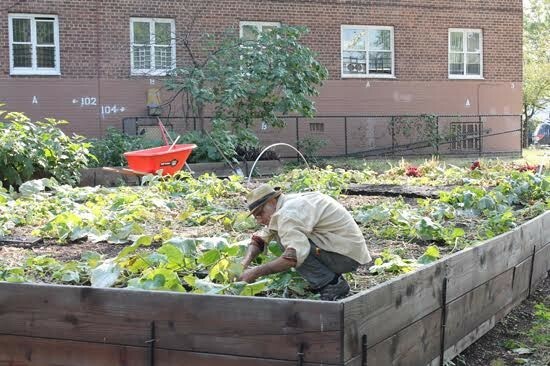 After viewing dozens of potential spaces throughout Lower Manhattan, it found its new home on Irving Place. The 3,000 square foot 1st floor, formerly occupied by a mystical religious community, was in bad shape when the new tenants first arrived—it was truly bare-bones. Sebastian Kaempf and Anke Roggenbuck of KARO Architects had their work cut out for them: Goethe-Institut New York’s staff needed to move into the new offices as soon as possible. Because the institute is part of a larger network, all plans had to be approved by the central organization, which is based in Munich, and by the Federal Minister for Foreign Affairs in Berlin. Two feasibility studies – one in the metric system and the other in imperial (and English) – had to be drawn up and approved before construction could begin. Not only did the architects need to squeeze a library, programming space, and language lab into the first floor, but they also had to comply with German guidelines, including the fire regulations that had forced the Institut to leave its original location on Fifth Avenue. A central spine of pivoting bookshelves anchors the multipurpose space. To the left, chairs can be set up and rearranged to suit programming needs. The library shelves, which extend 13 feet up to the ceiling along the walls, are constructed from Finnish birch plywood. The walls behind add a plum accent in an otherwise neutral zone. Toward the back, a bar area extends into the language center, which is tucked away under a newly-reopened skylight. 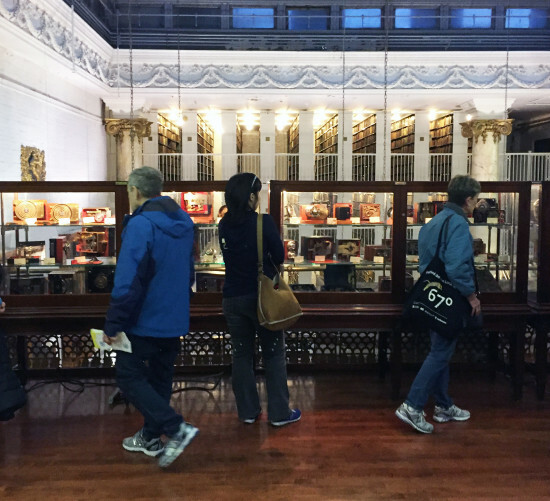 During the day, it serves as a quiet retreat for visitors to browse the library’s collection, work on their German, or take advantage of one of the largest German DVD collections in the United States. At night, it transforms into a space to mingle and chat during events. On the fourth floor, glass-walled classrooms promote a feeling of openness, while vinyl lettering provides a subtle visual filter to keep students focused on their studies. Many design decisions were mandated by the central guidelines of the Goethe-Institut, but the architects and New York branch still had plenty of room for creativity. Trapezoidal tables can be rearranged, in line with the flexible use of space downstairs. Flexibility is king in this project, which packs so much activity into a not-so-large space without ever feeling cramped. Tomorrow we’ll head to the General Society of Mechanics & Tradesmen of New York. Julia Cohen is the Archtober Coordinator at the Center for Architecture. Staten Island Museum at Snug Harbor 1000 Richmond Terrace, Snug Harbor Campus, Building A Staten Island Gluckman Tang Architects The recently reopened Staten Island Museum at Snug Harbor, housed in a former dormitory for aged and decrepit sailors, has a renewed vitality in a historic setting. “When restoring historic buildings, make interventions as quietly as you can,” Richard Gluckman told Archtober enthusiasts gathered at the museum today. The neoclassical building, originally designed by Richard Smyth in 1879 and landmarked in 1965, is part of a complex of historic buildings occupying the bucolic 83-acre Snug Harbor area of Staten Island. Gluckman Tang Architects was responsible for breathing new life into the building to better showcase the museum’s diverse collection spanning the arts, natural history, and local history objects. Over the past ten years, Gluckman Tang has been responsible for undoing previous—and precarious—restorations of the building, redoing the shell, restoring original elements, including the staircase and windows, and adding contemporary interventions to bring the building up to American Museum Association and LEED standards. The museum building serves as an important link between the local history and the museum’s mission. 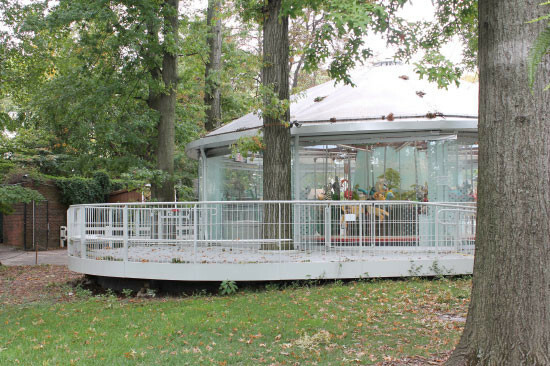 Gluckman Tang introduced geothermal well fields, paying tribute to the Staten Island Museum’s conservationist history. The auditorium and education space has linoleum floors, a functional choice by the architects, but also a reference to Staten Island’s Linoleumville, the location of first linoleum factory in the United States. Gluckman and his colleague James Young-Sik Lim discussed the “congenial relationship” between the historic and the contemporary that they nurtured during the renovation process. Visitors feel elements of the historic structure underfoot—the wood floors were repurposed from the building’s original pine beams. Gluckman also emphasized the importance of maintaining a sense of the historical usage of the building. He pointed to a compass rose inlaid in the wood floors—a contemporary interpretation of a historic detail that serves as a nod to the nautical history of the space, and as a centralized orientation point for visitors. Upstairs in the Treasure Box Gallery, the museum’s eclectic collection is displayed in a room flooded with natural light. The architects focused on flexibility within the exhibition spaces, a crucial aspect of the redesign, given the museum’s mission as a general interest cultural institution covering art, science, and history. The tour ended in the Mastodon Room, housing a life-sized replica of the now-extinct mammal. The mastodon (for which the museum is currently in the process of naming) serves as an elegant metaphor for the museum’s mission and Gluckman Tang’s renovation—history comes alive here, whether in the form of a giant-tusked creature or a beautifully restored cast-iron neoclassical staircase. 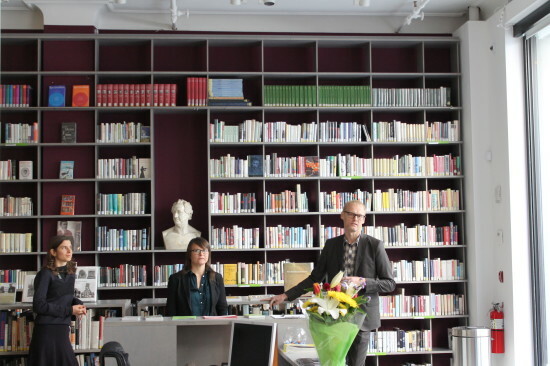 Next up, Archtober-ites will venture to the Goethe-Institute. Alex Tell is the Committee's Coordinator for the AIANY | Center for Architecture. Flatiron Building 175 Fifth Avenue, Manhattan D. H. Burnham & Co. (1902) A fantastic crowd of Archtober enthusiasts joined us for the outdoor history lesson from Alice Sparberg Alexiou—not only the author of The Flatiron: The New York Landmark and the Incomparable City that Arose With It—but also a descendant of a post-war Transylvanian real estate developer who owned, along with Harry Helmsley and another investor, the Flatiron Building for fifty years. Alexiou told us the story of the site and how it was never able to shake its shape-based moniker—even after Harry Black hired turn of the century starchitect Daniel H. Burnham of Chicago to design a Beaux Arts skyscraper to replace its more humble predecessor structures built in 1855. The “skinny little piece of pie” was the site of one of the first skyscrapers built above 14th Street—never, however either the first, nor the tallest, according to our guide, and never the Fuller Building that Black so earnestly wanted. 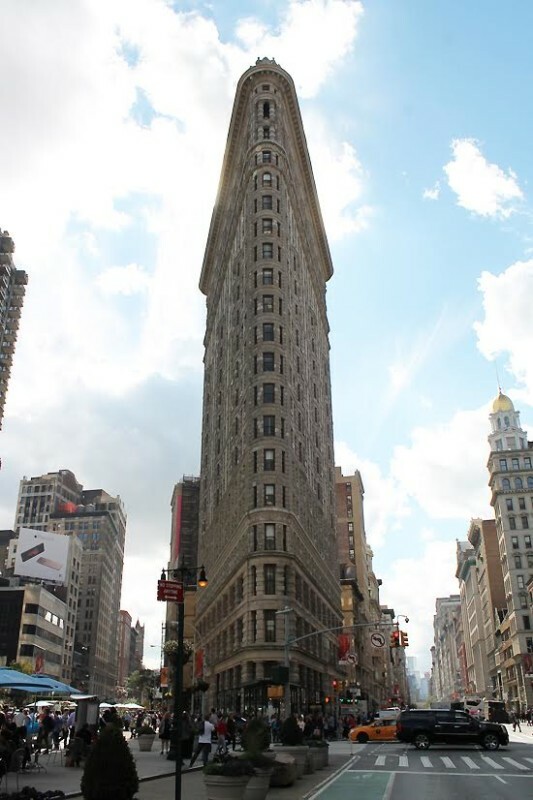 The building has changed hands a number of times, and it’s still the Flatiron. We see the Chicago influences in the articulation and patterning of the terra-cotta and limestone facade. Medallions, buttons, wheat sheaves, rosettes, sunbursts, egg and dart, along with Medusa heads warding off evil spirits adorn the densely textured surfaces. Hard to capture that richness in LEGO, but they sure got the basic idea correct in the LEGO Architecture version. Two guests won kits! Massing tricks from the Windy City include oriel windows that were used to break up the blustery microclimate created by standing in the free space of the intersection of Broadway and Fifth Avenue. “Well I’ll be Blowed,” chortled a postcard from the time. And it was windy, as we stood at attention while Alexiou lectured in front and vigorous dancers interpreted the moment behind. My recently repaired knee couldn’t keep me away from this very special event! Tomorrow we are off on another cruise in the islands: The Staten Island Museum at Snug Harbor will be our Archtober 15 midpoint port of call. Cynthia Phifer Kracauer is the Managing Director of the Center for Architecture and the festival director for Archtober: Architecture and Design Month NYC. She was previously a partner at Butler Rogers Baskett, and from 1989-2005 at Swanke Hayden Connell. After graduating from Princeton (AB 1975, M.Arch 1979) she worked for Philip Johnson. 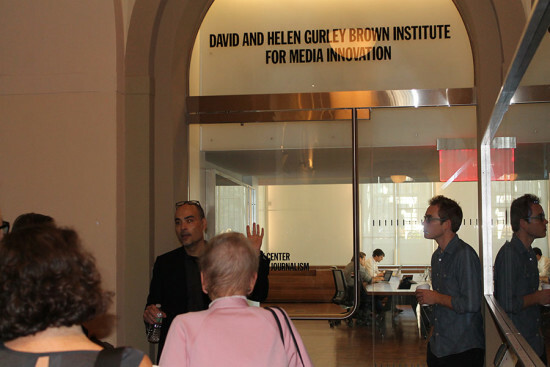 The David & Helen Gurley Brown Institute for Media Innovation is a busy hub of technology housed within a building from McKim, Mead & White’s late 19th-century campus plan for Columbia University. In subsequent years, the space, which occupies part of the eastern wing of the Pulitzer Building, was broken up into small offices. Marc Tsurumaki and his team at LTL Architects were hired to revamp the space for the Columbia branch of the institute, which is a collaboration between Columbia and Stanford Universities. Despite all of its high-tech screens, the institute’s facility really respects its history. Eleven double-height windows that had been partially blocked now bathe the room in natural light, although a scrim that covers the walls also serves as a shade to deflect daylight and prevent glare, a necessary consideration in a room that is always filled with people tapping away on laptops. Given the collaborative nature of the institute, the primary space was designed with flexibility in mind. It can host concerts, performances, workshops, seminars, and symposia, in addition to the more typical set-up that we saw today. Large walnut-topped tables are moveable but not easily moved – the architects allowed for flexibility, but only with intention. Although acoustical fabrics are used throughout (including hidden behind the scrim), additional nooks were carved out for greater intimacy. Small rooms dubbed “the garage” are nestled under the mezzanine level, which was located above the entrance to the institute to create an extended threshold opening up into the larger space. Niches along the northern wall of the room take advantage of its thick masonry construction. Waist-height walnut wainscoting gives the room a more human scale and links the niches to the larger space. The thick end-grain recycled walnut floor connects visually to the tables and wainscoting, and provides durability in an active setting. The scrim, which is suspended on a steel armature and hides HVAC and electrical systems, announces the institute’s purpose. Mark Hansen, director of Columbia’s branch of the institute told us that Mark Wigley, former dean of Columbia’s Graduate School of Architecture, Planning and Preservation, and currently a GSAPP professor, talks about the space as both a laboratory that facilitates the cross-pollination of ideas among fellows, as well as a physical center that refers to and reflects the institute’s mission. This agenda is reinforced at the entrance to the institute, where a solid plate aluminum installation incorporates mirrored glass to reflect the surroundings back into the display. This subtle mirroring plays with the relationship of new media to the historic building. 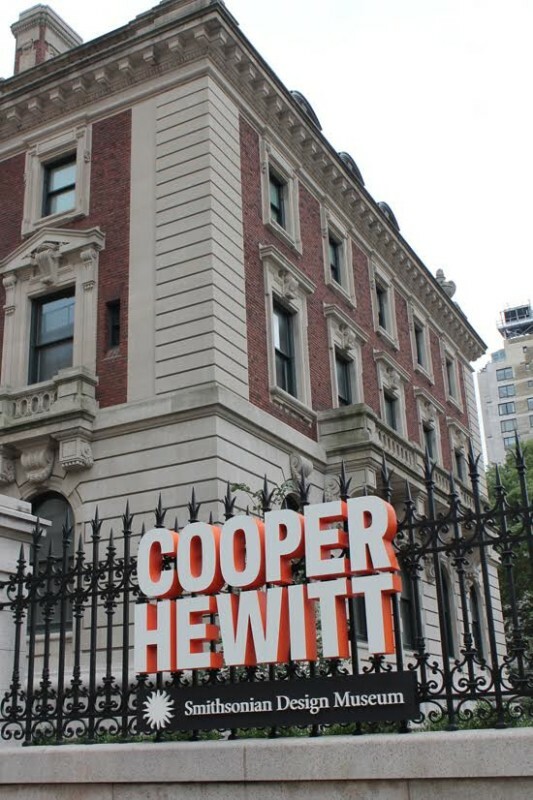 Join us tomorrow for a tour of another historic building: the Cooper Hewitt, Smithsonian Design Museum. Editions de Parfums Frédéric Malle 94 Greenwich Avenue, Manhattan Steven Holl Architects Passersby often stop to peer through the slipped-disk façade of Editions de Parfums Frédéric Malle in the West Village, according to Margaret Magnuson, who graciously opened the store to us this morning. Led by Olaf Schmidt and Filipe Taboada of Steven Holl Architects, our group of architecture and scent enthusiasts filtered into the 400-square-foot space. Although it is small, the shop is a jewel box of texture and form, an abstract insertion of a retail volume into a historic building. Two materials dominate the space. Foamed aluminum gives a porous texture to the walls and ceiling, and sleek black walnut shelves house the product. Expertly constructed by craftsman Javier Gomez, the shelves help anchor the slipped-disk motif that appears throughout the store. Because scents break down more quickly in the presence of heat and direct sunlight, a custom-built refrigerated cabinet preserves the integrity of the perfumes that will be sold. Three booths cut into the wall draw air through an internal system so that customers can smell a fragrance without overpowering the space. They offer an immersive and personal olfactory experience. Magnuson explained that rather than using scented cards that we so often see at large department stores, each salesperson has a deep knowledge of the fragrances and an instinct for the trade. Spraying 10 different perfumes onto cards can only be overwhelming; instead, customers might smell two or three in a visit. Then they can retreat to a secret garden in the back to mull over their choice. There’s no hovering or overzealous spritzing here. Because the building is located in the Greenwich Village Historic District, the architects had to submit their design proposal to the Landmarks Preservation Commission before construction could begin. They went through multiple hearings before it was approved, ultimately with the strong support of commissioners. The quality of the space is matched by Frédéric Malle’s vision. 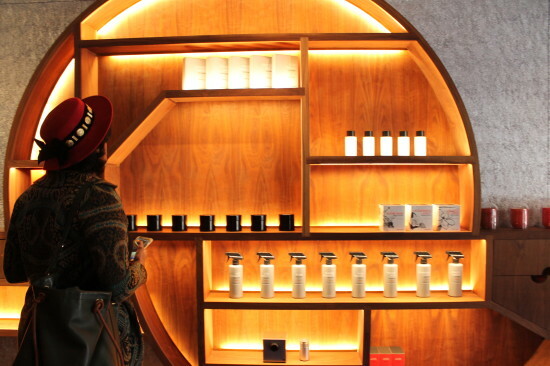 According to Magnuson, the company never discontinues a scent; it favors fit – finding the perfect scent for each customer – over novelty or trendiness. Malle cares deeply about functionality and detail, and he selected the architects with intention, giving them free reign over the design with the stipulation that portraits of perfumers who have developed fragrances for the company should hang on the wall, overseeing the operation. 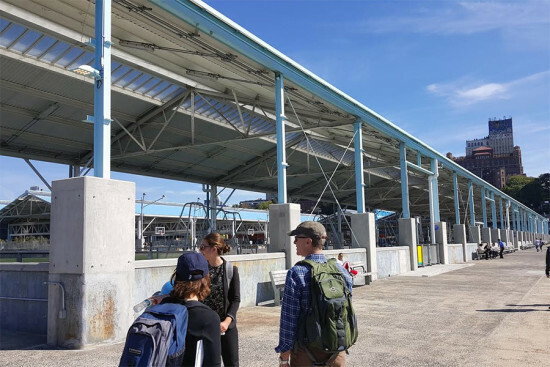 Take advantage of tomorrow’s weather with a tour of Pier Two at Brooklyn Bridge Park.